With the G5 iMac, Apple got things just right. The optical drive and USB ports are right there with the monitor, and it’s a design we can expect Apple to stick with as long as there are desktop PCs. As much as I love the iMac G4, I’m inclined to believe him: the G5 and beyond iMac design is one that’s built to last. 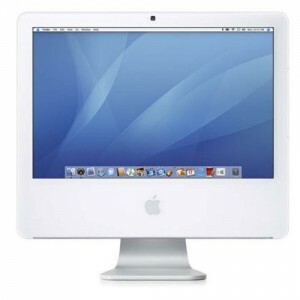 Even today’s aluminum iMacs are basically the G5 fancied up. The one thing I wouldn’t mind changing is the layout of the ports on the back. It is kind of a pain to reach around and pull USB dongles out. Maybe put them under the chin? Or on the side? I don’t know, but putting the ports on the back is clumsy. But the G5 design is simplicity at its best. People talk about the iPad being a “window” into the Internet world; I feel the same way about my iMac. The screen, the Apple logo underneath – and that’s it. Posted by davelawrence8 at 5:48 am on September 13th, 2010. 2 comments... » Categories: design, macs. Tags: apple, G5, imac, imac g5, low end mac. Subscribe via RSS. Posted by Newton Poetry — iMac in turquoise on October 7th, 2010. Couldn’t agree more about the port layout. Lower outside-right side of the housing please! Posted by Justin on November 10th, 2010.